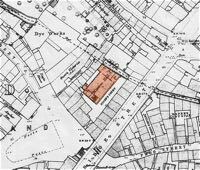 During the 1860s, the Ewing’s Lane School and Mission Society, ran Sunday Schools, from their premises in Ewing’s Lane. By 1871, they had outgrown the building, as an expansion of uses occurred, and an appeal was made for funds to construct a new hall. The chosen site was the former Boys' Industrial School, on Exe Island, along with eight dilapidated cottages at the rear, for the sum of £1,185. 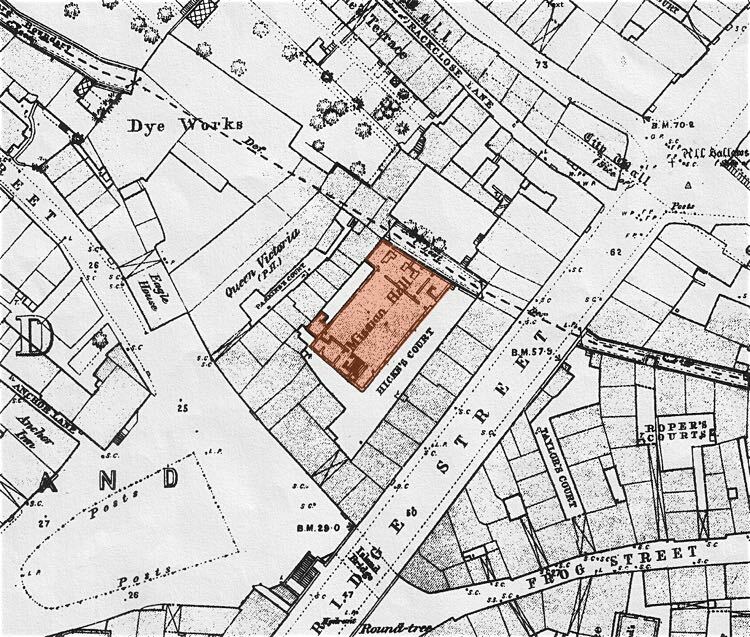 Hicks Court, the site of the eight cottages was chosen for the new hall, while the Industrial School site, facing Tudor Street, was to be retained. A benefactor, Mr F W Reynolds provided most of the estimated £2,500 construction cost. Mr R W Best was chosen as the architect, and Mr Mills was the builder. It was constructed of Westleigh stone, from a quarry some three miles from Samford Peverell, and Bath stone around the windows. 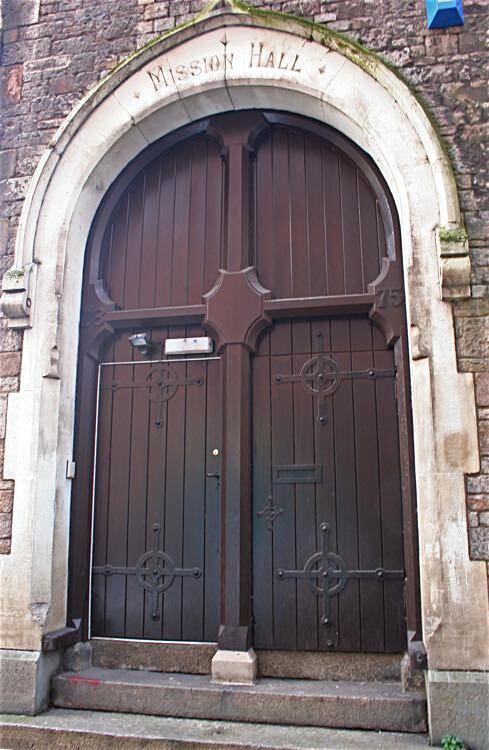 The doors were of pitch pine, a timber used elsewhere in the building. The main hall was on the first floor, which was reached by a wide staircase. Measuring 80ft 6in (24.5m) by 40ft 3in (12m), the hall was furnished with pews for 380 people, slightly raked to allow a good view of the platform. The upper hall could also be approached from an enclosed pedestrian bridge that sloped down from an entrance between 34 and 35 Bridge Street. 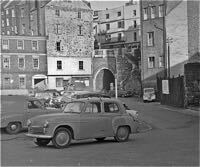 It became known as the ‘coffin way’ as it was easier to carry coffins in from Bridge Street, rather than up the stairs. The lower dining hall measuring 46ft (14m) by 36ft 9in (11m) was for the use of the Penny Dinner Society–removable partitions allowed the room to be divided into smaller areas, according to its use. The ground floor also accommodated a kitchen at the rear, which was fitted out by Whippell and Son with a kitchen range, hot water boilers, ovens, cistern, and equipment for cooking on a large scale. The two halls were heated by ‘Gurney stoves’. 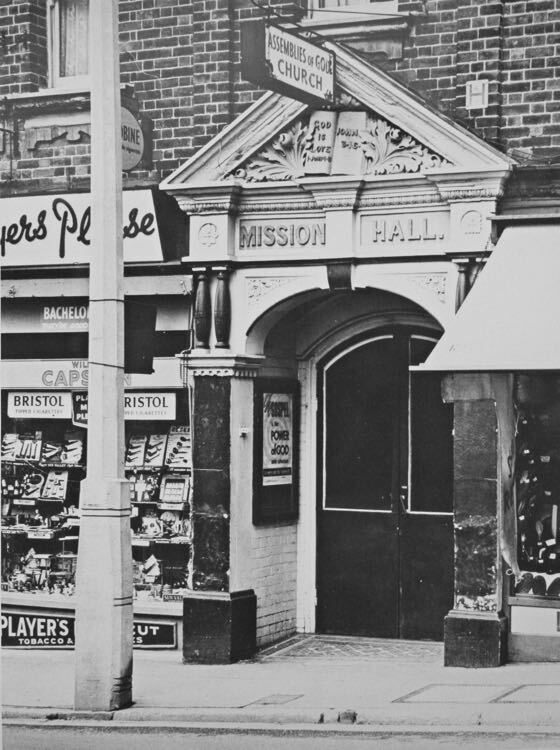 The Exe Island Mission Hall was opened on 9 March 1876 by Lieutenant Hay, and the event presided over by Captain Savile. Lieutenant Hay said that the new building was for both prayer and spreading the gospel among the poor. The building was to be used for Sunday School, Bible classes and cottage meetings. The Exeter Bible and Domestic Mission would use the hall for its mission to the poor. With all the preaching and Bible reading it must have been tough competing with the Theatre Royal, travelling fairs and especially the local beer houses. An advert in the Western Times on 4 March 1872 listed a committee of the Mayor seventeen committee members for establishing the Exeter Penny Dinner Society. Based on the London Destitute Children’s Society, it was intended to supply two meals a week, for the cost of 1d, to the poor children who attended the Ragged School and other schools of the city. To be eligible a child had to be an orphan, be the child of a poor single parent or be one or two from a large family that was in need. As the advert stated “The utmost care will be taken in assisting only the destitute and deserving.” The public were urged to subscribe to the Society to fund the meals. In November 1872, a letter appeared in the Western Times asking the public to contribute towards funding the dinners, which cost 3d in ingredients. Penny Dinners were only served November to April–fifty dinners a week were served November to December 1878, and seventy from January to April. Penny dinners continued into the 1930s. In the New Year of 1879, a ‘tea extraordinary’ was held at the hall for those who attended the Penny Dinners through the year, plus there who could purchase a ticket. The event was attended by 300 persons. By December 1878 cookery lessons for the working class were introduced, which must have been a relief from Bible study, and somewhat more useful. In times of national emergency, the kitchen and dining room at the mission proved to be useful, although, not always a success. In 1917, in the third year of the First War, the Government arranged to set up around the country communal kitchens, with a view to reduce food waste, fuel and encourage economies of scale. The Victoria Hall had already run such a dining room, when on the first day, between 400 and 500 women and children had turned up for the 230 meals available. Tuesday: Baked hot-pot and milk pudding. Wednesday: Soup and baked date pudding. Thursday: Savoury soup and jam roly-poly. Friday: Soup and boiled current pudding. Saturday: Soup and meat and vegetable pudding. The Mayor J G Owen and the Mayoress Mrs Owen opened the proceedings for the first meal. The Mayor told the eager diners that the meals were provided because of a shortage of food in the country, and it was not a charity, nor ‘soup kitchen’. On the first day 230 meals were served, and on the second day 267. By the fifth day 108 meals were served, and a local when asked if she had attended the facility said “No, I haven’t come to that yet. It would be a disgrace if I were seen there”. Within two months the kitchen was forced to close due to lack of custom. It is thought that many locals were reluctant to be associated with a venue that catered for the poor. Farthing breakfasts were a necessary, and welcome, feature of the West Quarter, ensuring children of the poor were fed before school. They were introduced by a Mr A Davey of the Salvation Army in 1902, for poor children, initially from premises in Cricklepit Lane. After the First War, the Mission Hall was the only venue left in the area, to serve breakfast during the winter months. Each child would receive as much cocoa as they wanted and either a large bun of a half pound loaf (200 grams), sometimes with jam. From October 1931 to March 1932, 180 children were served a farthing breakfast each morning. Some families sent five hungry children for their breakfast. Such services ceased during the Second War, as the state introduced rationing to make sure everyone had enough to eat. Abstinance was always an important doctrine for those running the Mission, with the serving of tea and coffee, to keep people out of the pubs. The Pioneer Coffee House was opened in Edmund Street to the same end. People were encouraged to sign the pledge, and were given a Band of Hope card to remind them of their promise. 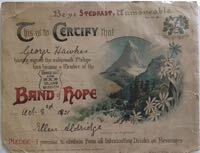 One such was nine year old George Hawkes, who despite his young age, signed the pledge in 1921. 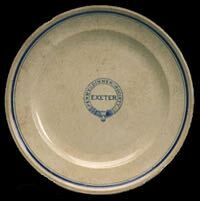 In 1940, in the first year of the Second War, what would become known as British Restaurants were established in Exeter. A central kitchen was opened in Paul Street to supply 1,000 meals a day to elementary school pupils, selected on medical grounds, by the School Medical Officer, on the payment of 5d a meal. 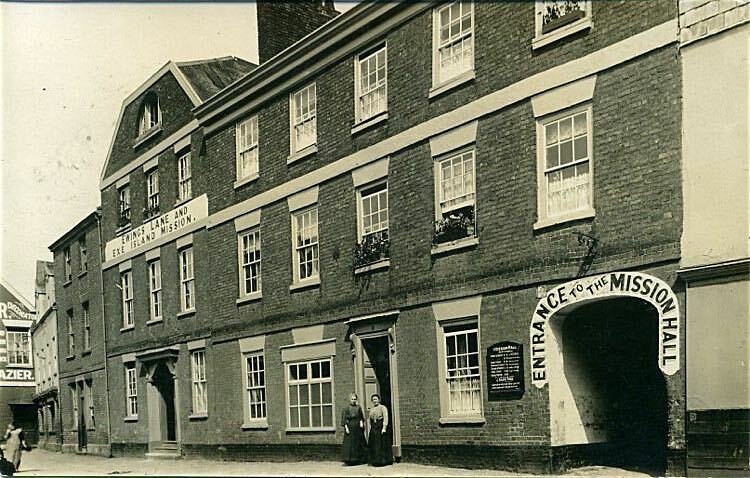 The Exe Island Mission was one of four other places across Exeter be a meal centre, and eventually a British Restaurant. The Exe Island Mission Girls’ Guild was founded in 1945–by 1959 it had 50 members. The girls formed a band which played in four church parades during 1949. Eventually, the Mission Hall became less useful for the locals, as farthing breakfast and penny dinners were no longer required, and organisations such as mother and baby clubs preferring more modern surroundings. The growth of the Welfare State drastically reduced the use of the building for social purposes. The upper Mission Hall became an Assemblies of God church for a time, before it closed. 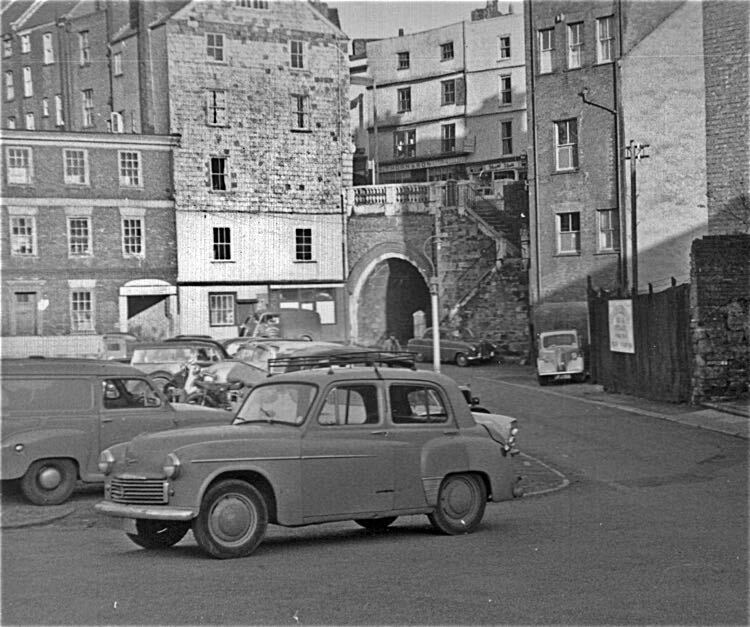 The buildings at the front were demolished when the new north bridge was constructed. 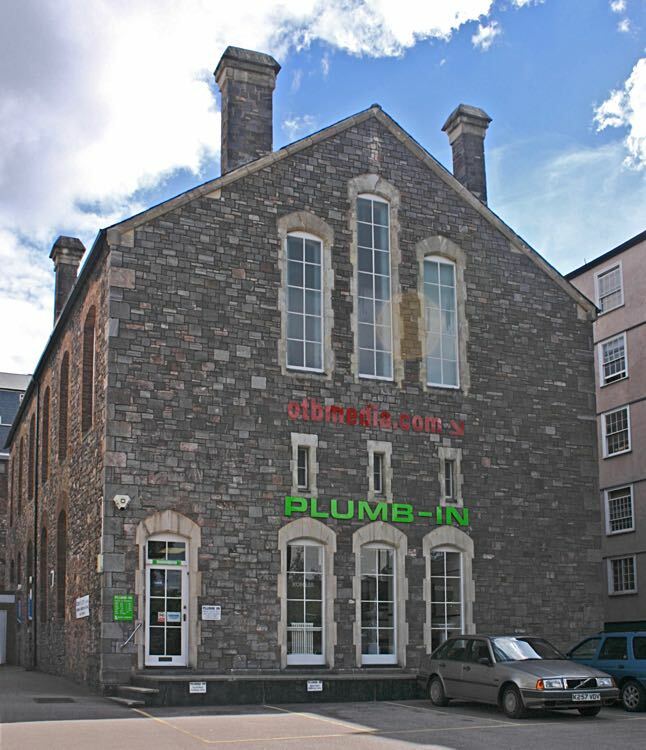 It is now the Plumb-In Centre, which many pass on their way up Western Way from crossing the bridge. Sources: Exeter newspapers from the British Library Newspaper Archive, Besley 1916 Street directory, childrenshomes.org.uk, everydaylivesinwar.herts.ac.uk (article by Julia Neville) and Brenda Roe. 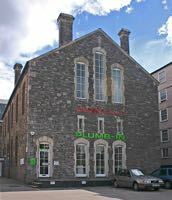 The hall is now the home of Plumb-In and an IT company. The entrance to the hall was through the arch on the right. The main building in the photo was the Boys' Industrial School. The entrance from Bridge Street leads to this covered stairway. 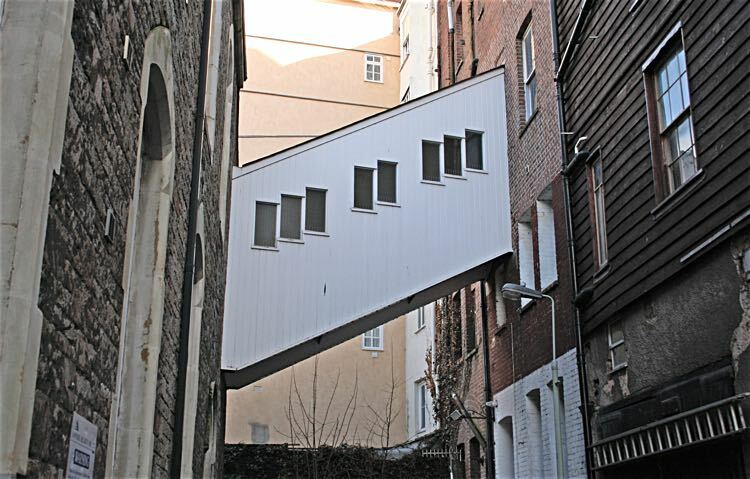 It is sometimes referred to as the 'coffin way'. The entrance from Bridge Street leads to the 'coffin way. One of the pine doors still remains on the side of the building.